Con trails over Oughtibridge / Wharncliffe repeater transmitter. Oughtibridge TV transmitter against the setting sun. Graphic showing the use of a repeater / relay transmitter to improve coverage in a valley which lacks the all important “line of sight” from the main transmitter. Note that the Emley Moor transmissions are shown in yellow (B group) and the Oughtibridge transmissions in green (for C/D group). 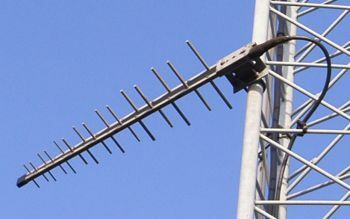 Close up of a repeater transmitter`s aerial array, this is Oughtibridge and it is a good example of a smaller repeater. For a full list of all the repeater transmitters see the Ofcom pdfs or Digital UK (use the drop down menu to change the region). A repeater (or relay) is a transmitter which receives a signal from a main TV transmitter, remodulates it onto a different set of frequencies and then rebroadcasts it again. They are used to transmit into areas which are unable to receive good signals from the main transmitter. Most repeaters only broadcast to a relatively small number of people. In the case of Oughtibridge the repeater retransmits into the low lying areas of the Don valley around Wharncliffe and Oughtibridge, hence the name. 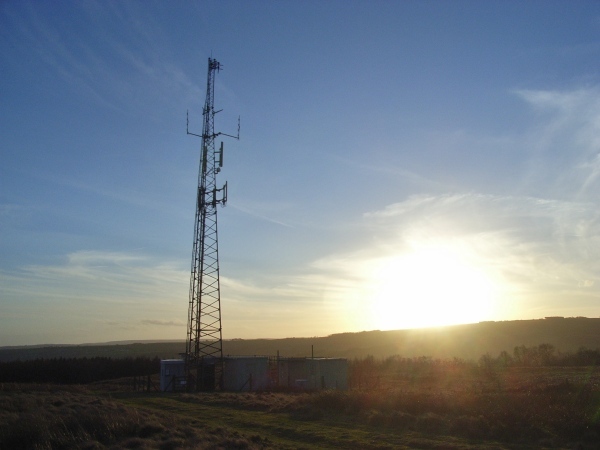 The signal is received from Emley Moor (situated to the NW) using the log periodic at the bottom of the picture and then rebroadcast via the Log array at the top of the mast into the valley to the South and West. There are about 1100 repeaters in the UK, of which 30 are larger repeaters which are actually used by quite large numbers of people*, thus they transmit all 6 digital MUXES. In addition, during the 700MHz switchover (2018 to 2020), another 11 repeater transmitters became 6 MUX. Unfortunately all the other relays, the great majority of them, only transmit three (PSB) MUXES, i.e. not all six of them. The original plan was for another 200 of the larger repeater transmitters to broadcast all 6 MUXES, but the commercial broadcasters declined to pay for it ! However, the 3 PSB MUXES will still give all the five channels which were originally transmitted on analogue, plus a load of others, plus four HDTV channels. Just to hammer the point home, to get all 6 digital MUXES you need to get onto one of the 91 six MUX transmitters, though this has become much easier after the post switchover power increase. Repeaters are usually vertically polarised, but about 70 are horizontal (e.g. Dronfield). 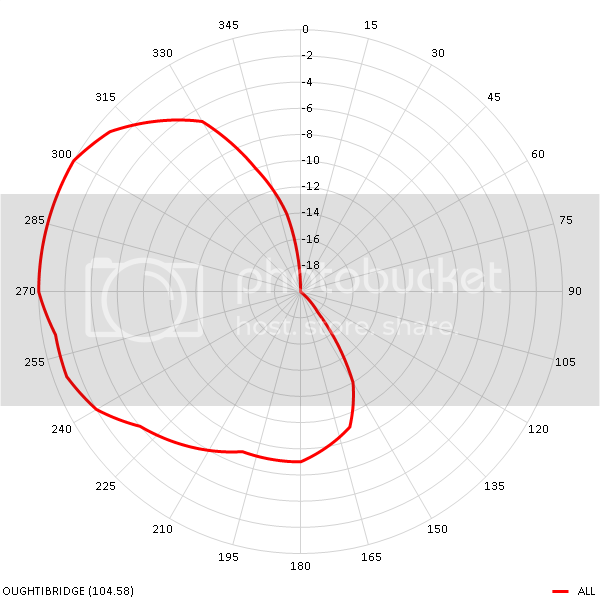 Although this represents around 7% of all repeaters the larger ones (which transmit to far higher numbers of people) are all vertical, thus probably 99% of people on repeater transmitters would have aerials vertically polarised, assuming the aerial`s correctly polarised, obviously. Note. Many repeaters have restricted radiation patterns (see that for Oughtibridge) and are relatively low powered. * Rather surprisingly, some repeater transmitter (e.g. Sheffield) actually transmit to significantly larger numbers of people than some of the main transmitters ! These aerials are of BBC design but manufactured by Chelton electronics. They are 48" long by 13" wide, with 30 elements and a gain of 6 to 8dBd. These must be the most ruggedly constructed aerials around and are generally used for broadcasting but also by the military. And they should be well made, because they weigh nearly 3kg, and cost over £500 each ! ? ! Close up of the receiving Log Periodic aerial at Somersham repeater transmitter. 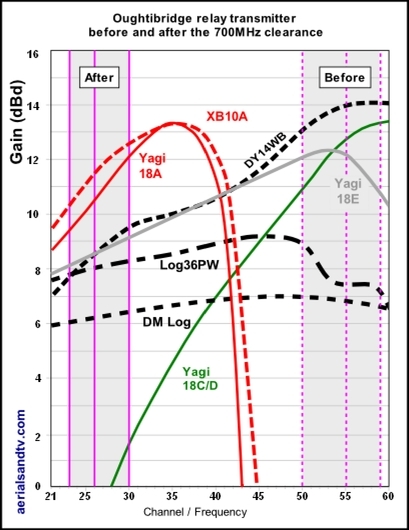 Use of Log Periodics for transmitting. "Ruggedised" Log Periodic (see above). Note the broadcast authorities use of Log Periodic aerials (see below). They use them wherever possible, we use them wherever possible, and so should everyone else ! Also see basic digital fault finding. Switchover occurred at Oughtibridge in Sept 2011. 700MHz clearance is due at Oughtibridge in Q1 2020. The bad news, and this may well apply to many other C/D group repeaters, is it`s going from a C/D group (CHs 50, 55 & 59) to an A group (CHs 23, 26 & 30). 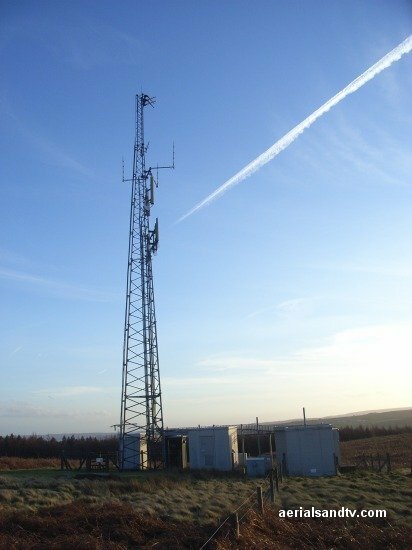 Basically there`s a good chance that those with C/D group aerials may have problems, particularly if they are in a poor signal area, see Oughtibridge transmitter before and after the 700MHz clearance. Oughtibridge Transmitter including low power digital transmissions, or not ? What is a Repeater (or Relay) Transmitter ? Transmitter radiation pattern for Oughtibridge transmitter. Note how the transmissions aren`t Omni directional. Graphic courtesy of Mike Dimmick. Oughtibridge / Wharncliffe television transmitter was opened in 1980 and broadcasts into the Upper Don valley. It is necessary due to Emley, Belmont and Crosspool transmitter`s being hidden by the hills. It is a relay of Emley Moor and is a Vertically polarised C/D group of 8W. Now 8W isn`t that much, and sounds even less in comparison to a main transmitter, or even the 39W it used when it broadcast analogue, but, for Oughtibridge, in a way, it`s a power increase ! How can a power increase be a power decrease ? ! ? Well at our test site, which is directly across from Oughtibridge transmitter, a DM log used to average 60dBμV, for analogue. The figure would vary from day to day, but not by that much. For digital the DM log gives about 54dBμV. so the received signal was at the bottom of the range. so the received signal is now at the top of the range. The same applies to the main transmitters. From the test site Emley`s 870kW on analogue gave an average of 87dBμV, but now, with digital transmitted at 174kW, a DM log gives about 81dBμV. Before, the received analogue signal was 7dBμV over the recommended level, but now the lower power digital signals are 21dBμV over recommended ! Also note the power decrease to dBμV readings. For a signal power level approximately one fifth we get a signal drop of 6dB. As with most of the smaller relays only MUXES 1 to 3 (the PSBs) are transmitted from Oughtibridge, not all six digital MUXES. In this area we would put customers on Emley where ever possible (for reception of all 6 MUXES) but as one drops down into the valley this becomes more problematic. However, if one examines the topography map some people have a view NNW up the Don valley and so can still get onto Emley even if they live on the valley floor. The mast is quite well hidden behind Wharncliffe Woods but if one looks closely one can just see the transmitting array of Log Periodic aerials above the tree line. The Channel Allocation Guide reveals that all 3 channels are transmitted on the same frequencies as both Wincobank and Dronfield repeaters, though one would not normally get any co-channel interference due to their low powers and the distance/topography between them. A single track stub of the ex Great Central Railway (which originally linked Sheffield to Manchester via the Woodhead tunnel) runs in the valley below. These days it only sees one train a day running from the steel works at Aldwarke to the plant at Stocksbridge. How the mighty have fallen, back in the 1840s this railway was one of the first main lines built in this country and it was electrified at great expense (and six men`s lives....) in 1954. 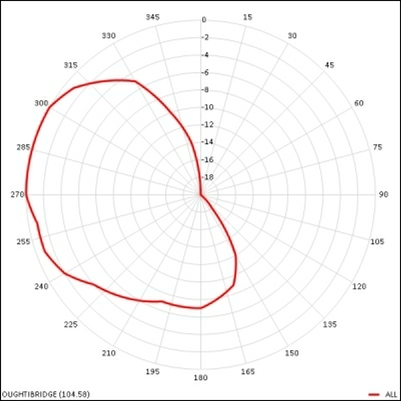 This graph illustrates clearly how, post 700MHz clearance, some aerials, mainly C/Ds but also some widebands, may struggle to pull in an adequate signal. The good news is that swapping to an A group aerial will actually put you in a better position than you were before (i.e. a C/D or wideband on a C/D Winter Hill). This is because, watt for watt (transmitted power), A group signals [being a lower frequency] travel further more efficiently than C/D signals. Provided you have an aerial tuned to pick them up at peak efficiency, i.e. an A group aerial !